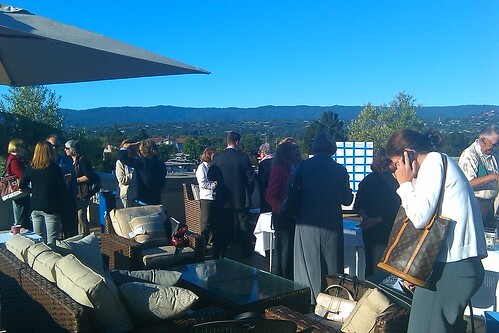 I had a chance to attend yesterday’s Real Estate BarCamp in San Mateo County, California. Thanks to all who contributed to making this event a success from the organizers through to real estate professionals who shared ideas on what’s working for them tech-wise. However, an even larger percentage of real estate professionals seem to still question whether social networking services, online videos, blogging, etc., are worth the time and effort. And, they may be right. As you can probably imagine, the real estate professionals who’ve had success with, say, Facebook as a marketing tool were taken aback by people who suggested that Facebook is a waste of time. More than a few agents said that between 1/3 to the majority of their current business comes from online leads, which suggests that it plays a key role in making a living off real estate for many. More than once, the least tech savvy of the group’s eyes glazed over during conversations that mentioned things like blogging platform decisions, syndicating blog posts, RSS, SEO, Tweets, Facebook updates, etc. between various marketing platforms, and the word “embedding”. There are a few issues where worth addressing. For one, the terminology of online marketing and social networking is far from intuitive to non-techies. While it may be possible to work on better ways to explain things, I think much of this will be solved by tools that take the tech out of the process. This comes across as a “too many vendors” problem. Real estate agents who are dealing, personally, with domain name registrars, web hosting companies, email providers, online storage services, design companies, virtual tour providers, mobile site providers, IDX solution providers, syndication solutions, blogging platforms, etc., are often creating a huge headache for themselves. The first issue is cost: Too many agents are having their credit cards hit monthly from so many different vendors that they can barely remember what each charge is for, much less whether the service continues to be worth it. The bigger issue is integration. Buying services from a dozen vendors is painful enough on the cost side, but the bigger issue is the technical challenge of getting all of the services to talk to each other. This is a challenge that the more tech savvy of agents seem to enjoy, while it intimidates the heck out of the rest to the point of quitting. In the end, if an agent is very comfortable with technology, doesn’t mind dealing with lots of vendors, and is willing to bear the agent-level systems pricing involved with going alone, it’s hard to say that they’re doing things wrong. The return on their investments should speak for itself. However, they could also reach a point where tinkering with technology is trumping talking to current and prospective clients. For everyone else, there are some real advantages to tapping into platforms that tie the technology together for them. This allows real estate professionals to focus on the aspects of online marketing that have the potential to generate results: Publishing content and interacting with prospective and current clients. The bonus here is that technology and marketing costs to agents (both financial and time) drop significantly when the integrated technology solutions are purchased in bulk as a real estate marketing platform. Those savings can be redirected into creating professional content, online advertising, and spending more time doing real estate rather than technology. Investments that have the potential to increase the top line while simultaneously improving the bottom line. This is a great write-up ed. It captures both the excitement and some of the angst of Realtor’s love/fear relationship with using technology cost effectively. Social media tools are more than lead widgets – they are social, and should be fun too!